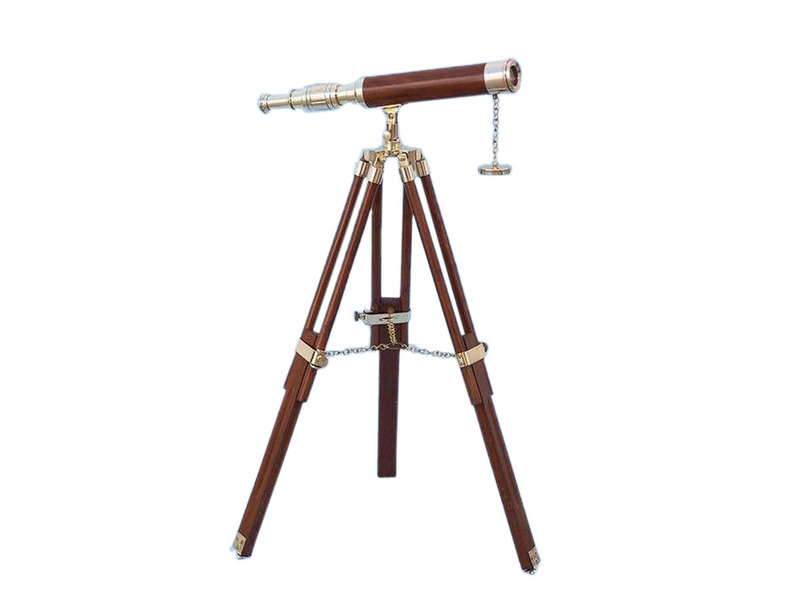 The Hampton Nautical Brass Telescope 30” with a wood handle is a true nautical gem that can serve as a functional telescope or a symbol of seafaring pride in any room or office. The stand has an adjustable knob to change and hold a specific direction. Focusing is accomplished by adjusting the eyepiece ring on the telescope tube. The scope also has a polished solid wood handle and a solid brass cap, linked by chain, to cover the lens when not in use. The wooden tripod stand features smooth, polished round legs, each with solid brass fittings and a screw release to let you adjust the height. A solid brass chain holds the three stands together so the telescope can maintain its position. Aside from aiding in navigation and mapping, in times of war the brass nautical telescope was an essential tool. Used to spot enemy vessels, the telescope allowed commanders to formulate plans of attack as well as utilize signal flag communication between ships. By the late18th century it had become possible to manufacture telescope brass instruments on a larger scale, and navies were making great use of the new tool. 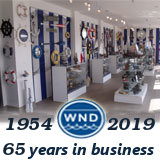 The design that we know today became common among sea farers, naval and pirate alike, and remains practically unchanged. Originally crafted from leather and wood, often with brass fittings, they later came to be crafted from solid telescope brass and used by sailors to spot approaching ships, enemy targets, and obstacles in the high seas. Though the design is much the same, with the technological advancements in the lenses and mirrors, the brass spyglass has become an ever more powerful tool. From astronomers to sailors, world travelers to boy scouts, the amazing telescope brass model is in use throughout the world, and continues to contribute amazing discoveries to both science and industry.